This is due to damage to the blood vessels of the retina. Don't wear dirty contact lenses. Always get your eyes checked-up before planning pregnancy and later during 1st trimester of pregnancy. Existing eye problem may worsen during pregnancy. Lens of the eye becomes opaque (cloudy), resulting in decrease vision. In diabetics cataract occurs 2 times more commonly and at early age than normal people. 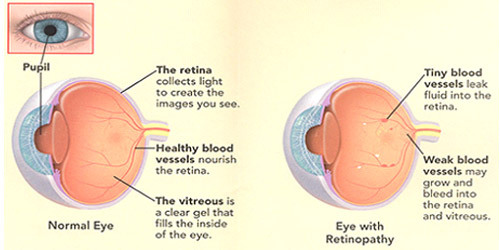 There is weakening and breaking of small blood vessels in the retina (screen) of the eye, resulting in decreased vision. It generally occurs after 10 yrs. of onset of diabetes and patient may not have any symptoms initially. 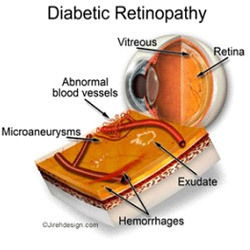 90% of Type1 and 60% of Type2 Diabetic patients have retinopathy after 20 yrs of onset of the diseases. Generally the disease is asymptomatic i.e. painless and initially vision also may be normal, thus proper screening is very important. Fundus examination must be done once in a year to recognize retinopathy at an early stage. LASER is the choice of treatment for retinopathy. 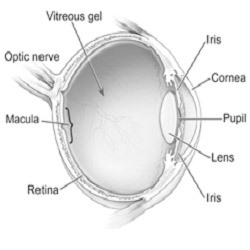 This is due to increase pressure of the liquids inside the eye leading due to decrease blood flow in the blood vessels of retina & optic nerve, resulting in decrease vision. Vision can't be restored once lost, hence early diagnosis & treatment is a must. These are very common and should always be treated urgently. Examples are stye, conjunctivitis etc. 1. Non-Proliferative Diabetic Retinopathy (NPDR). 2. Proliferative Diabetic Retinopathy (PDR). Q. How Laser treatment is beneficial for Diabetic Retinopathy? High power Lasers are used to coagulate (clot) the bleeding blood vessels. Laser treatment prevents progression of diabetic retinopathy and deterioration of sight. Q. How is Cataract (lens opacification) treated? Cataract surgery is done by a technique called Phako-emulsification which should not be mistaken for laser.